When it comes to staying active and exploring a new area up-close and at your own pace, there are few options that are better than cycling holidays. If you love cycling then exploring new locations on two wheels should definitely be on your holiday wish-list. Note from Monty: This is a promotional post from Belle France, for which they paid a small fee. Hopefully you find it helpful and it gets your cyclo-juices flowing. With its long history of hosting the Tour de France, one of the world’s most renowned cycling races, France has always been a popular destination for cycling enthusiasts and active families. One of the leaders in providing cycling holidays in the country is Belle France, from whom holiday makers can choose between luxury cycling holidays or slower paced biking tours. Belle France specialises in cycling holidays that offer the opportunity to explore some of France’s most beautiful areas, including the country’s famed wine producing regions, historical châteaux and picturesque Mediterranean coastlines. The Loire Valley, sometimes referred to as the ‘Garden of France’ is an area of outstanding beauty and stunning landscapes, making it one of the most popular places in Europe for cycling holidays; and for good reason! As the ‘Garden of France’ the cycling routes wind through the vineyards and quaint rural towns, so make sure you are most of the ample opportunities for a quick tasting. The river valley itself is also on the list of UNESCO World Heritage Sites due to its rich past. It’s where Joan of Arc led the French Army and where Attila the Hun’s advance into Europe was stopped. There are also over 300 Chateaux spread throughout the region, many of which can be visited during the cycling tours. Provence – From Idyllic Olive groves to the glamorous Mediterranean coast. A two-wheel holiday is a wonderful way to explore another one of France’s most beautiful and historically rich regions, Provence. As a large region that spans from the French Alps down to the Mediterranean, Provence has cycling routes to suit all abilities. Provence was the first province over the Alps occupied by the Romans, who left behind many of the regions wonderful ruins and archaeological wonders. 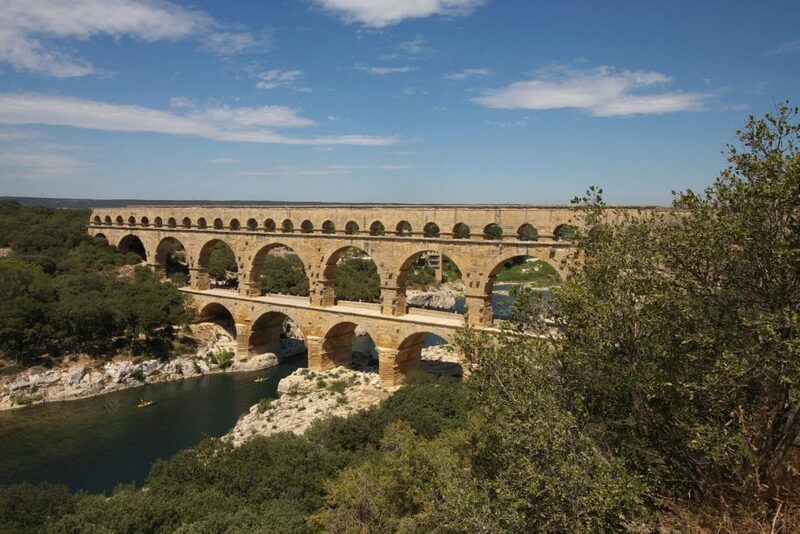 The most famous of these, the Roman aqueduct the Pont du Gard is a huge attraction for cycling holidays. Due to the region covering such a vast area, it of course has many varied landscapes to offer. Each town has its own distinct personality, from sleepy rural villages to wine and olive producing towns that grow bigger and bigger as you cycle closer toward the coast. With such varying appeal, Provence is truly unforgettable. Another of France’s largest regions, Aquitaine rolls down from the foothill of the Massif Central all the way to the Spanish border. Like with Provence, this gives the region routes to suit all abilities and offers up an amazing cultural mix for you to enjoy on your cycling holiday. The gentle foothills in the north of the region, particularly in the Dordogne is like stepping back to another time in France’s history. Here you will find rustic farmland and villages lost in time, along with some of the most famous UNESCO sites in Europe such as the Lascaux Caves. The south of the region near Bayonne and Biarritz could not be any different from the hills, forests and farms of the north. Instead here you will find open sunny stretches and luxurious seaside tourist spots. Its proximity to the Basque Country gives this area a very strong cultural mix of French and Spanish culture, and is particularly known for its delicious food and amazing architecture, which harks back to long and varied history. Whatever your cycling abilities or tastes in culture (and wine), France is an excellent destination for some summer cycling, and these routes just go to show that the old saying is true; it’s the journey not the destination. You can find out more about Belle France cycling holidays by clicking here. Nice places for cycle holidays. From Idyllic Olive groves to the glamorous Mediterranean coast might be the best place to travel. Thanks, Andrew for the update. Just back from a week in Mallorca at Stephen Roche training camp – food , wine , bike hire and guided routes in beautiful countryside and excellent route choices. All in €1000 . French holidays above look very pricy by comparison. Interesting article – I have done a fair bit of cycling around the Loire valley (plus points – it’s flat and there are really good designated routes along the river) and also in the Dordogne, near Montignac/Lascaux. In general, even if you dont go for an ‘organised’ cycling expedition in France, it’s usually relatively economic there to hire a bike for a number of days. And off the main roads, traffic is often quite light and the scenery is fantastic.